Dyer's Hunting Lodge and Camps are located in the beautiful Tobique Valley. The Tobique River is a tributary of the world famous St. John River, which winds its way through the heart of New Brunswick, Canada, to the Atlantic Ocean. The Tobique is situated about 110 miles north of Fredericton, the provincial capital. It winds its way into a rich wooded interior, where deer, bear, moose and most fur-bearing animals are in abundance. 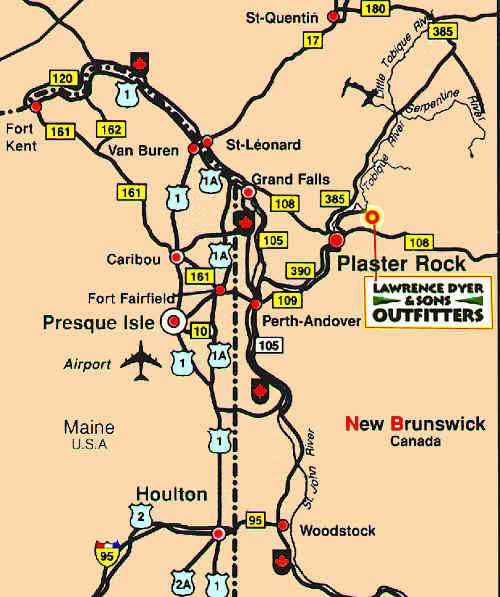 It is the greatest small mouth bass river in New Brunswick and also yields trout, that will test many an angler's tackle and skill.